The United States exported 401,000 barrels per day (bbl/d) of crude oil in July 2014, the highest level of exports in 57 years and the second highest monthly export volume since 1920, when EIA's published data starts. Recent crude oil exports are also noteworthy for both their origins and destinations. As a result of existing U.S. crude oil export restrictions, most U.S. crude exports are sourced domestically and are sent only to Canada. 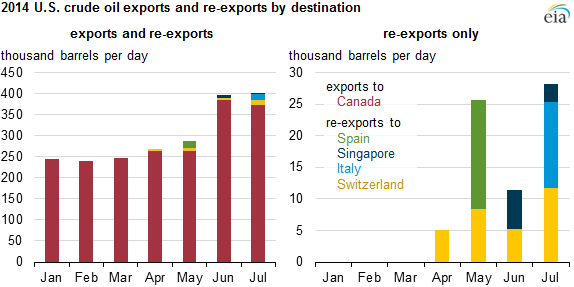 However, since April, crude exports have included modest amounts of Canadian-produced barrels that were moved through the United States and then re-exported to Switzerland, Spain, Italy, and Singapore. To export crude oil from the United States, a company must obtain a license from the Bureau of Industry and Security (BIS) of the U.S. Department of Commerce. Under export licensing requirements, there are certain transactions that will generally be approved. Licenses for other exports of U.S.-origin crude are considered on a case-by-case basis. For such other exports, the regulations describe the characteristics of transactions that will generally be approved as in the national interest. The recent shipments to Switzerland, Spain, Singapore, and Italy were small volumes of permitted re-exports of Canadian crude oil that were not commingled with U.S.-produced barrels. As is the case in the United States, some of the growth in Canada's crude oil production is taking place in areas with limited infrastructure to bring the crude to refineries for processing. With limited pipeline and rail takeaway capacity, some Canadian producers are testing the economic viability of moving crude oil to the Gulf Coast for re-export to other markets. It is unclear if this recent trend of Canadian re-exports from the Gulf Coast will continue, and if so, for how long. Several proposed Canadian pipeline projects may provide producers with alternative routes for delivering crude to markets beyond North America, but the timing of each of them is uncertain.